The global financial crisis that occurred between years 2007 to 2008 was a reminiscence of what happened in 1929. The crisis saw the wobbling of more economically developed countries like the U.S.A, Iceland, France, Germany, Canada, United Kingdom, China, Greece and Spain. The largest bankruptcy in U.S history was witnessed in this period by Lehman brothers that had been in existence for over a century. Clients were on the verge of losing their pensions and savings due to the bankruptcy. There was unrest in London, Paris and Beijing as people demonstrated while governments blamed the United States. In Wall Street New York City, Bear Stearns, one of the oldest and biggest banks was waffled by the crisis. Bear Stearns was the fifth largest investment bank in the United States at Morgan. The U.S also witnessed the collapse of the world’s biggest insurance company; American international group which was bailed out of misery by the government. In the state of California, the economic depression led to the loss of jobs and millions of foreclosures. The rate of forceful evictions by sheriffs increased from 1 to 2 a month to between 20 and 30 in a week. Homeowners fell into despair and resolved to live in tents, streets, and cars. Some committed suicide as a result of frustrations. Women shelters in the state were filled to capacity with single mothers and 1.5 million children left homeless. The global financial collapse was also great in Los Angeles where over 100,00 military veterans were rendered homeless. Victims suffered from post-traumatic stresses and other mental illnesses two years after the meltdown. This resulted to L.A correctional facility housing the greatest collection of mental illnesses in the country. In London, the Anglo-American Financial Systems began to tremble in September 2007. Northern Rock, Britain’s mortgage lenders began applying for financial support from the bank of England. In Paris, BNP Paribas bank, a giant French bank discovered United States’ toxic securities in August 2007. They quickly reacted by stopping withdrawals and shutting down accounts which drew attention from the country’s ministry of economic affairs. European governments stumbled to the turmoil when banks and mortgage lenders in Britain, Germany and France started collapsing as at October 2008. Iceland crashed harder than any other country. Prior privatizations of its banks and opening operations in London that made British citizens deposit money in high-interest Icelandic accounts contributed to a crisis. The then British Prime Minister Gordon Brown froze Icelandic companies in the United Kingdom and listed them as terrorists. 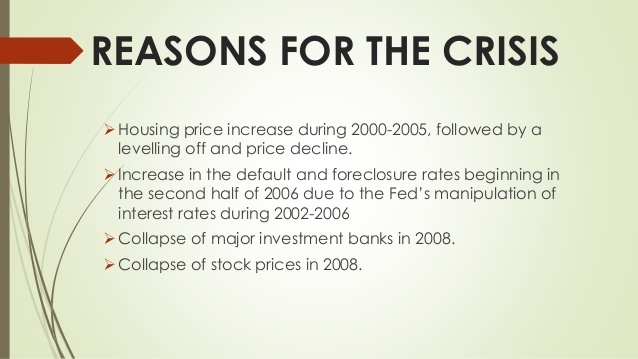 The financial crisis inquiry commission formed in 2010 attributed the meltdown to the American real estate bubble. Mortgages were given to everyone including teenagers and the poor who couldn’t pay thus foreclosure. The Securities and Exchange Commission, as well as the treasury, was liable. Market fundamentalism, greed, corruption, negligence and unethical behavior such as fraud were also contributing factors. Free market economies like Iceland and Laissez-faire in France paid dearly during the meltdown. President Sarkozy later abolished Laissez Faire in France. Many Real estate developers were dubbed Con artists in Spain after gaining wealthy from the boom by bribing mayors. Several crisis meetings were held by leaders in Washington to curb the crisis. Billions of taxpayers’ money was to be used as well as funding from the World Bank and IMF. There was a quest for new international financial regulations. The world might have recovered from the global financial meltdown of 2008 but scars still exist. It’s inevitable to control another crisis from occurring again evident by cities like shanghai, New York, and London that thrive to be the financial capital of the world. We still have a role to play so as to prevent the next global meltdown from occurring.